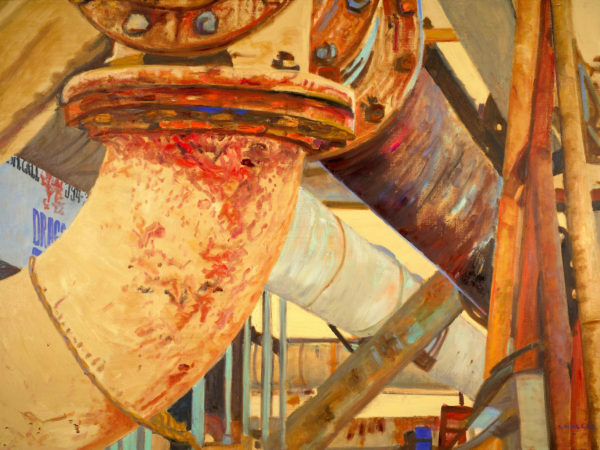 We are so excited about the the opening reception for Laura Waller’s “Industry and Urbanity” opening reception tomorrow night at the gallery. We hope you will join us but if you can’t, you can come in to see her work on display until July 14th. In anticipation of the opening we presented Ms. Waller some questions relating the show and her life and she very graciously responded with some very thoughtful answers. I am happy to share our interview today on the blog and know you will enjoy learning more about this accomplished artist! Your show “Industry and Urbanity” is opening this Thursday at the gallery. Can you tell a little bit about the show and how you chose the pieces to include? After four years I finished the Working Port Series but I am still exploring two themes that run through these works. The first theme is what I call Drop Ins. I am fascinated with situations where I am dropped into a world I don’t know. It is there but I don’t know it is there—hence the Port, the cement plant and in some respects, the theater. How many times over the past 25 years have I passed through Dragon Cement on US1 but not passed into it? The plant and the excavation site exist on either side of the road but are shielded by the foliage. I had the opportunity to do an after hours private hard hat tour and was amazed. To look down from the 9th floor of the tower and see the deeply terraced landscape of the limestone vein on one side of the road and the simple industrial shapes of the massive plant in all hues of grey on the other side of the road was astounding. Dragon Cement No. 7 is an attempt to capture these shapes which remind one of a Morandi-type still life of a landscape. Dragon Cement No. 4 is the scene in the harbor across from my house in Rockland where a family of osprey has built their nest atop the ladder on the Dragon Cement barge. The barge has not moved in over a year. Giant wings flap if you approach the nest warning one away from this locale where nature and industry’s needs have met. As I understand it, you developed your passion for art while in college at Tulane University. Can you share what sparked your passion and the path you took to follow it? After falling in love with art history classes in college, I of course got a Masters in social work, became a therapist then naturally morphed into financial planning before segueing into painting. I joke, but that is the real path I pursued. Along the way I used art as a way to escape the stresses of the stock market while I ran my financial planning firm. I firmly believe all of these life experiences shape the way I perceive the world which consciously and unconsciously becomes part of my paintings. You currently live and work in your studios in both Florida and Maine. Are your studios and work habits similar in both locations? Are you inspirations easier to come by in a certain location? My work habits and days are similar in each place. An early riser, I transition from home to studio by going to a local restaurant( Rock City Cafe in Maine) and painting or drawing in my sketchbook over a pot of tea and surrounded by neighborhood friends. I then return home to my studio and paint from 8 am to 2 pm. It works best for me to have regular hours as I did as a businesswoman lest I get distracted. 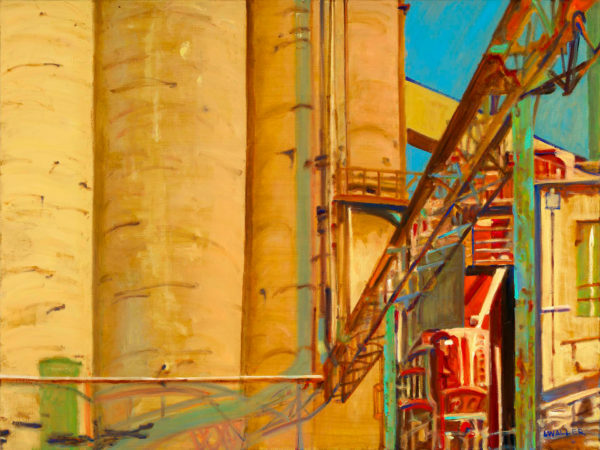 You have often painted works related to the waterfront but you have recently begun to focus more on industrial sites. Can you tell me more about your interest here and inspiration? The concept of “wabi sabi” intrigues me—there is beauty in the humble, the incomplete… Hence, the luscious shades of rust in Dragon Cement No. 2 with its crisscrossing pipes intersecting on the canvas. A colleague once said that I paint the grit that starts the pearl. A poetic way of saying it! Radio City Music Hall No. 1 celebrates the jewel of neon on a cold December night in the city. 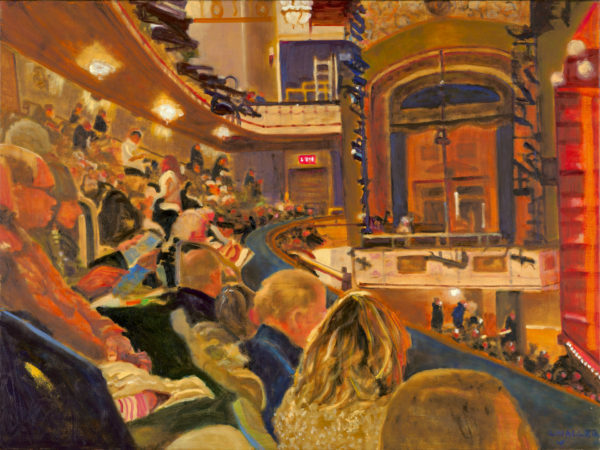 Can you tell me about the theater paintings featured in the exhibit? Shubert Theater NYC No. 2 shows the restless anticipation before the curtain rises. I painted it during an artist residency. A fellow artist from France wanted me to remove the exit sign and then the painting would be timeless and could be the 1850s. Never mind that women didn’t streak their hair then, I felt sadly that the exit sign is so much a sign of our times. When we enter the plane, the theater, the movie house, one notes the exit in case of an incident. There is a person pointing in the foreground. Is it because the curtain is rising; something unexpected is happening; or there is danger? I know you have inspired many artists but are there some that have inspired you? Tina Ingraham who taught me how to transition from watercolors to oils. Helen Frankenthaler whose painting, Canyon, best captures the awesome feeling of looking into the canyon. I tried to emulate that capture of the sensation when I painted 57th Street NYC and hoped to share a bit of vertigo when looking up. Giorgio Morandi’s beauty in simple subjects. The Ashcan School and its celebration of the real life of real people. This is like asking me to play favorites with my children. Perhaps 57th Street NYC explains the second theme I continue to explore. I usually paint angles. Often the vanishing point is off the canvas so the viewer has to join me in completing the image. This often hints at the massiveness of the structure as you are only seeing part of it on the canvas. I am intrigued by why, when I look with my head bent to the side , does the horizon still seem straight across or the skyscraper still look straight up in my mind? I am rarely holding my head vertically straight and yet lines are straight and perpendicular in my perception. This painting lets the buildings tip dramatically as in reality they did when I snapped the photo to paint from. 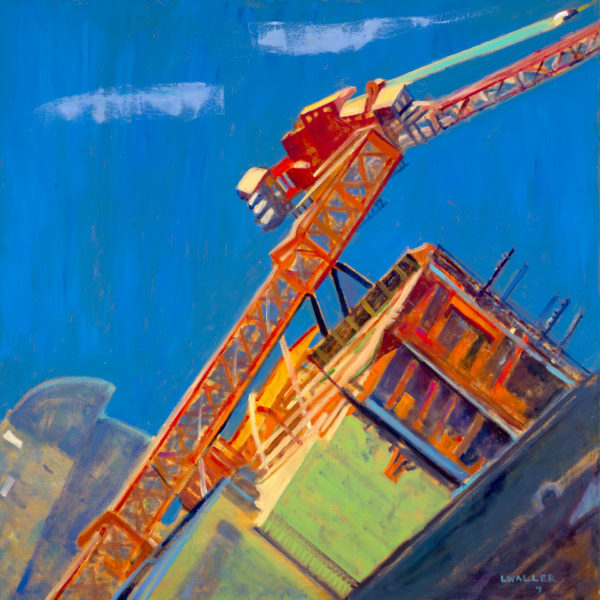 This particular painting ,which seems to have a house at the intersection of the cranes way up in the sky, brings to me a childhood image of the giant in Jack in the Beanstalk. 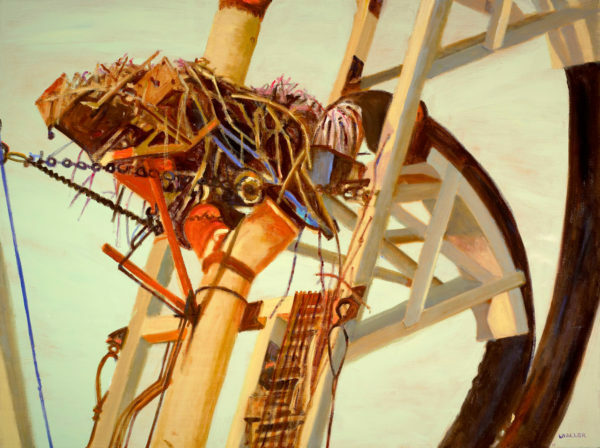 Thanks again to Laura Waller for giving us an in-depth look into her paintings and her work. You can find her website HERE as well as following her on Facebook HERE. Don’t forget to come to the gallery tomorrow night to see the paintings discussed here and celebrate Ms. Waller’s opening. It is an evening we are very much looking forward to!